The second phase of excavation conducted in the historical and ancient port of Adulis and the findings of new traces and artifacts would further reinforces the Adulite civilization, explained the Eritreans and Italian archeologists working at the site. The researchers, during an explanation they gave to Ms. Askalu Menkorios, Minister of Tourism, during her visit to the site on February 12, indicated that they found original walls built by indigenous people and that disproves the argument that Adulis was not built by indigenous people. Ms. Askalu, commending the efforts so far made to uncover the secret Adulis is holding underlined that the excavation so far conducted would help acknowledge that Adulis was the center of civilization in the region and in the world. She further explained that the findings would help rewrite and document the history of Adulis that was distorted. During the occasion, it was disclosed that the traces and artifacts of potteries, charcoal, bones and ornaments so far found are indications that Adulis has been the main door for the expansion of Christianity to the Horn region. 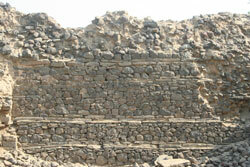 The ancient port of Adulis is located 60 km south-east of the port city of Massawa. The Great UK Festival Eritrea’s cultural Bonanza – Thousands of people had the opportunity to celebrate and participate!